An online portal for views from within and around the Charter Township of Shelby — home of more than 73,000 residents, who know there is no better place to live, work or do business. 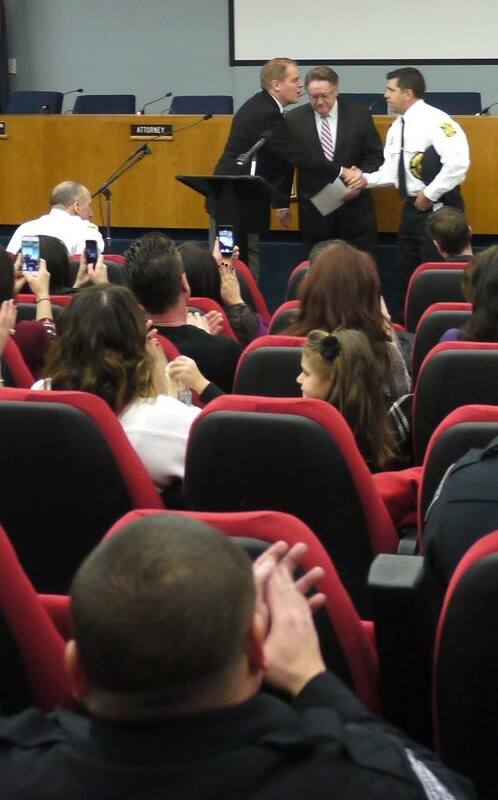 Shelby Township Police Chief Robert Shelide formally swore Deputy Chief Mark Coil, Lieutenant Jeff Daniel and Sergaent Lawrence Rice into their new Shelby Township Police Department ranks at an April 27 ceremony in Shelby Township Hall. 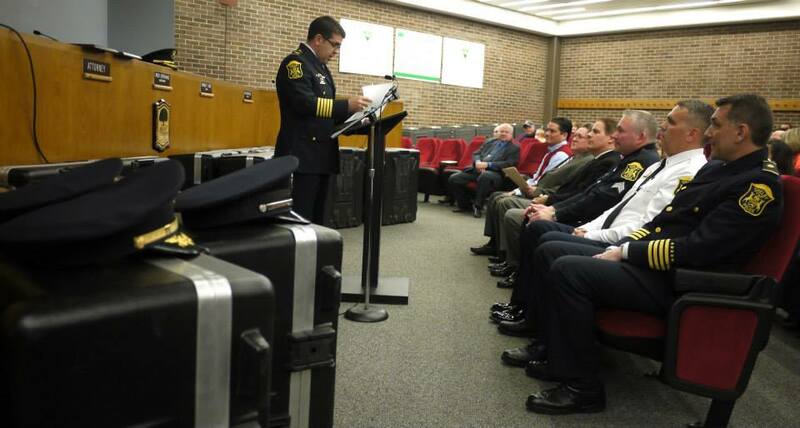 Shelby Township Police Chief Robert Shelide addresses the crowd during the swearing-in ceremony. 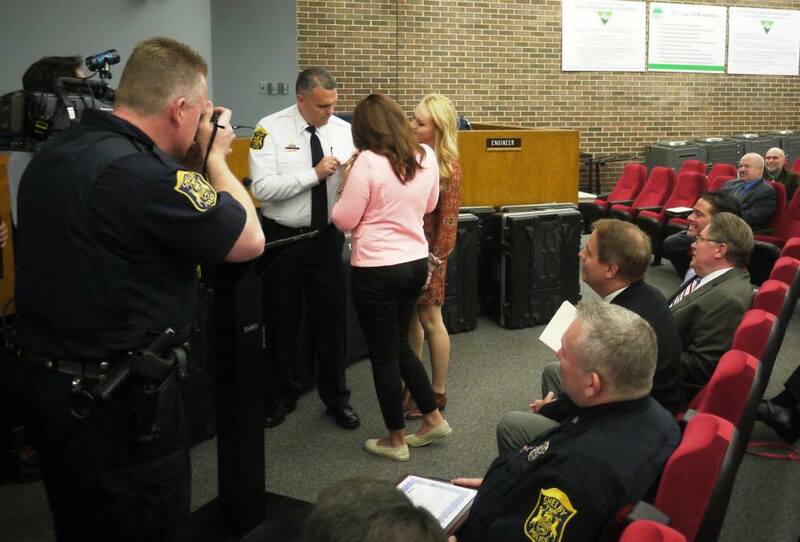 Shelby Township Police Lieutenant Jeff Daniel receives his new badge from his daughters after taking the oath for his new rank April 27. 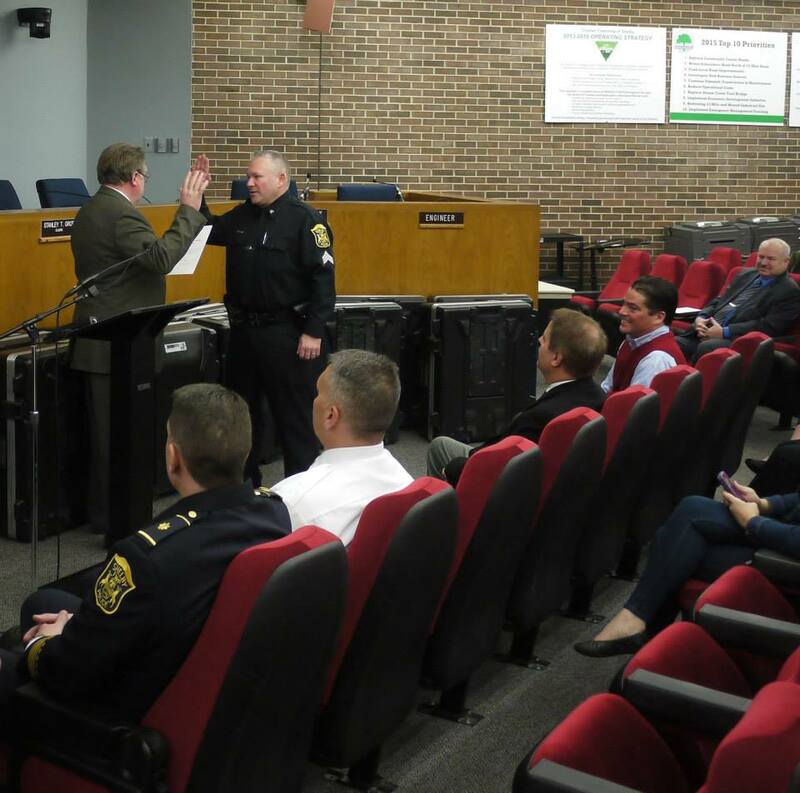 Shelby Township Clerk Stan Grot administers the oath to the Shelby Township Police Department’s newest sergeant, Lawrence Rice. 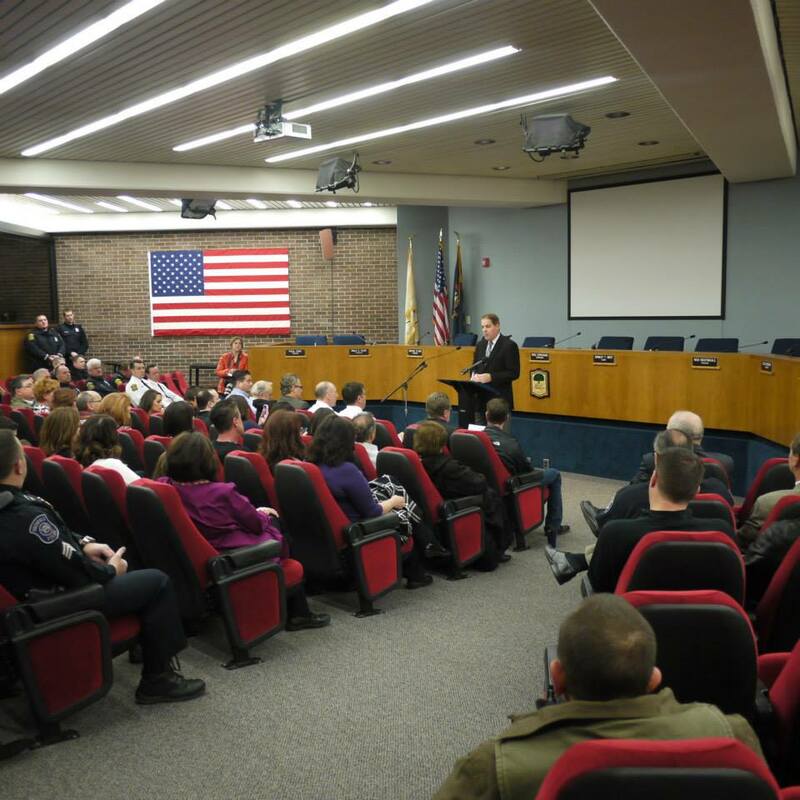 Shelby Township Supervisor Rick Stathakis addresses the gathered crowd of friends, family and supporters prior to the swearing-in ceremony for the newest members of the Shelby Township Police Department’s command officer ranks April 27. 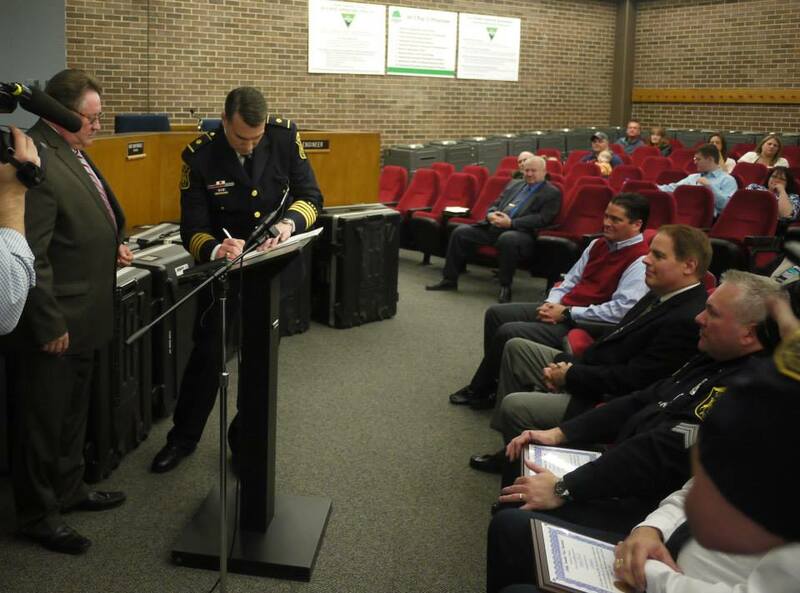 Shelby Township Deputy Police Chief Mark Coil makes the historic move of signing his name to his oath. With his swearing in, Coil formally became his department’s first deputy chief. 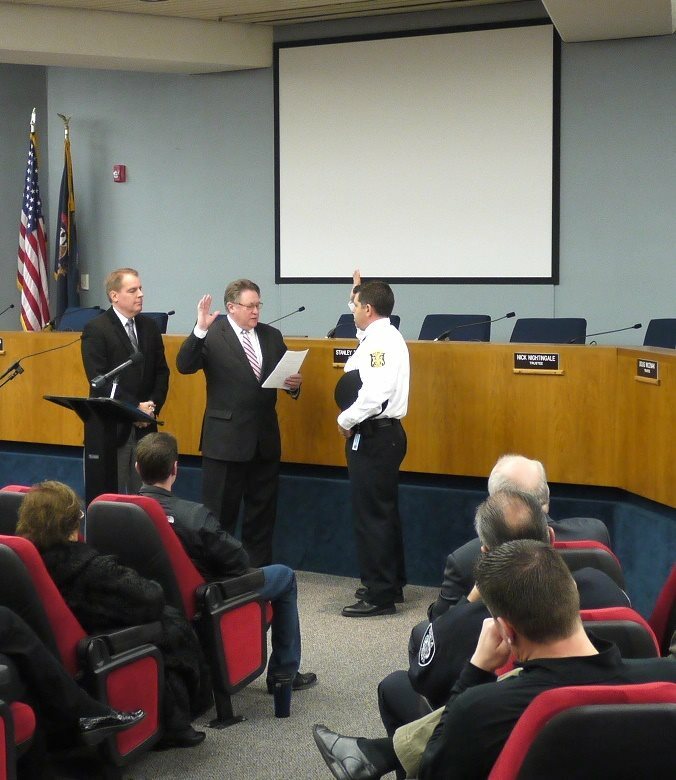 Patrol Officer Kevin Bailey was sworn in as the newest member of the Shelby Township Police Department March 9, 2015. 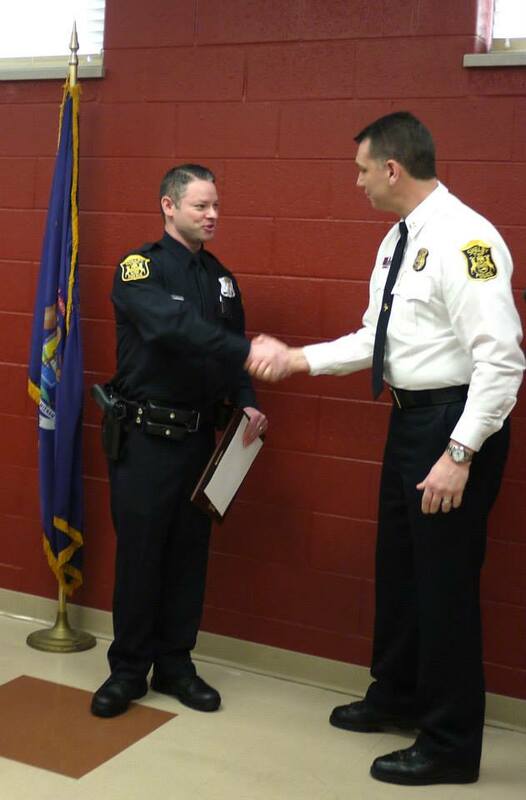 Officer Kevin Bailey receives his badge. 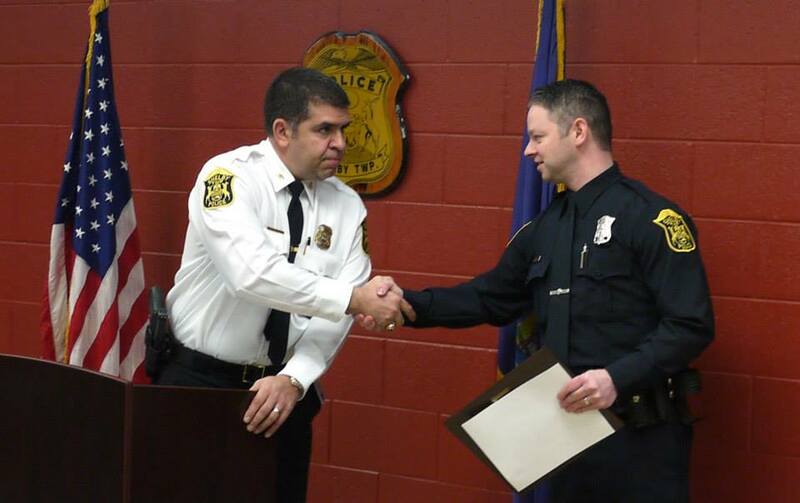 Police Chief Robert Shelide congratulates Officer Kevin Bailey. 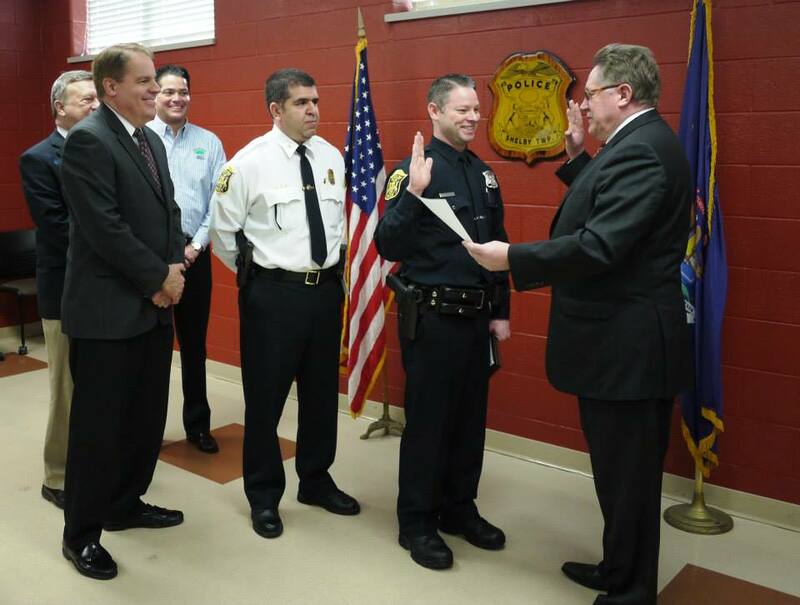 On January 19th, 2015, Robert Shelide was publicly sworn in as Shelby Township’s Chief of Police. Chief Robert Shelide joined the Southfield Police Department in 1994 after spending the first seven years of his law enforcement career with the Detroit Police Department. 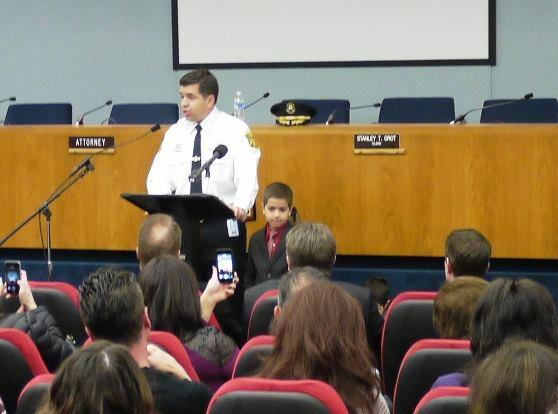 In Southfield, Chief Shelide spent 10 years as a detective. After his promotion to Sergeant in 2004, he spent five years as a supervisor in both the Investigations and Patrol Division. In 2009, Chief Shelide was promoted to the rank of Lieutenant and served three years as a watch commander. In 2012 he was selected as Coordinator of the Patrol Division where he was in charge of the departments specialized units including the Crime Prevention and Community Policing Unit, Traffic Safety Bureau, School Resource Officers, and the Tactical Crime Suppression Unit. In July of 2013, Chief Shelide was named Acting Deputy Chief by Chief Hawkins and placed in charge of the Patrol Division. 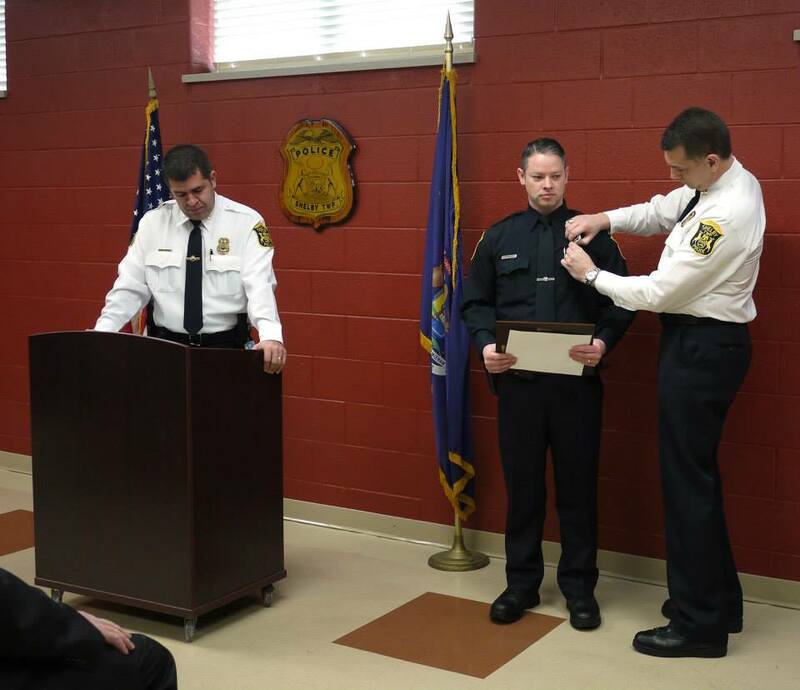 In June of 2014, Chief Shelide was formally promoted to Deputy Chief and remained in charge of the Patrol Division, serving as Division Commander. Chief Shelide is currently working on a master’s of intelligence analysis at the University of Detroit Mercy and holds a graduate certificate of achievement in criminal justice from the University of Virginia. He earned a bachelor of science in community development with a concentration in public administration from Central Michigan University. He is a graduate of the FBI National Academy, and the Northwestern University School of Police Staff and Command. 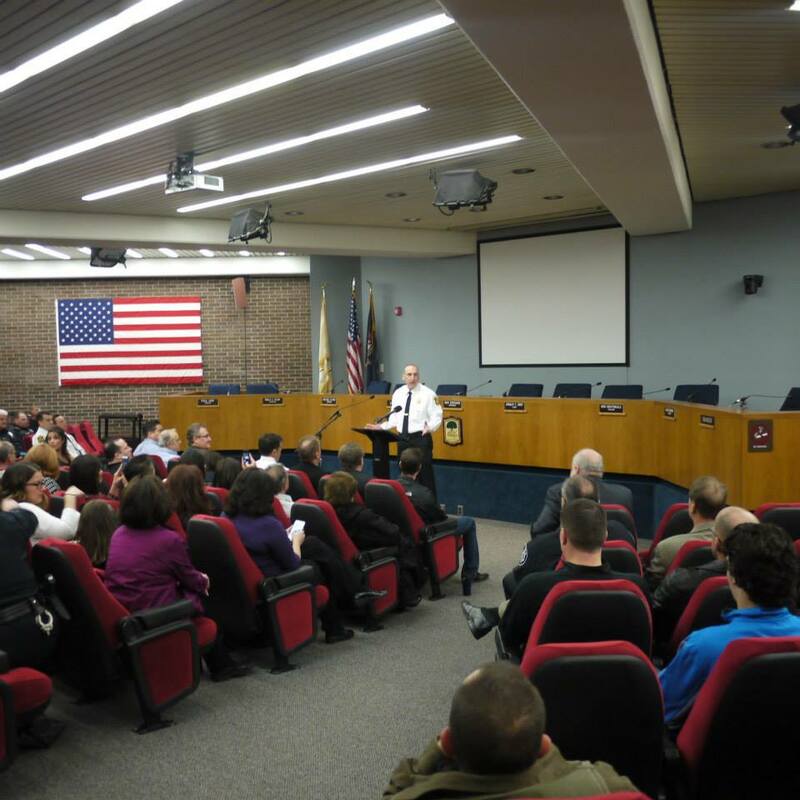 Chief Robert Shelide addresses a room full of supporters in Shelby Township Hall after being sworn in as the sixth chief of the Shelby Township Police Department. 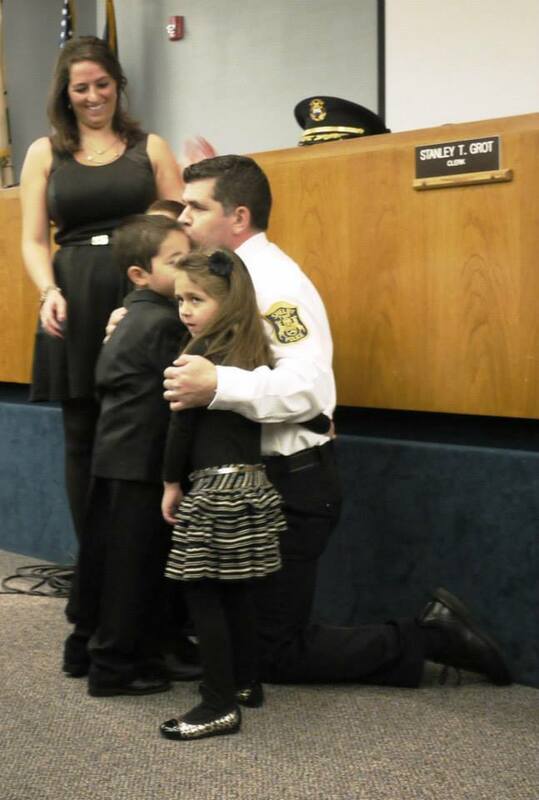 Chief Robert Shelide and his family share a moment after the chief’s official swearing in. 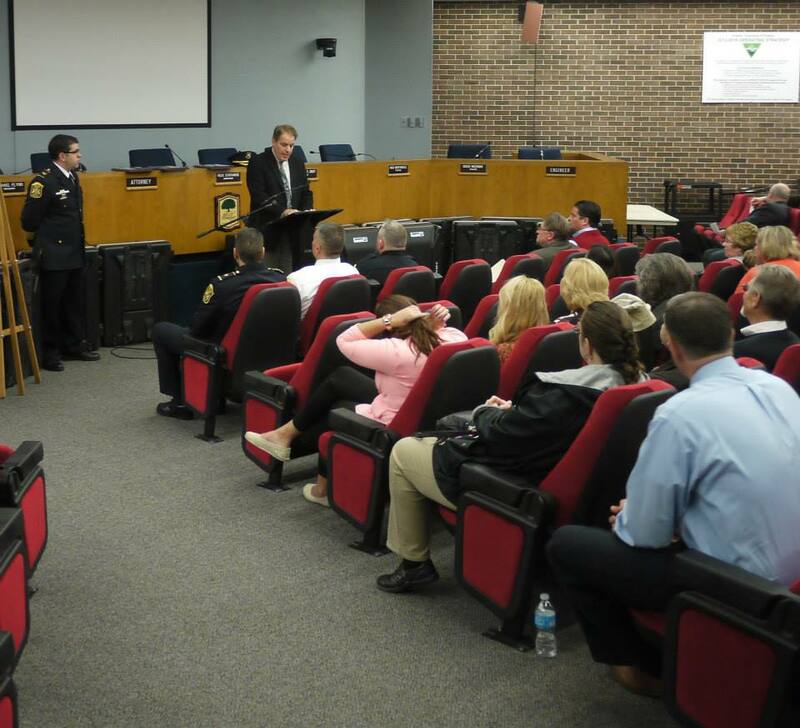 The Shelby Township Hall board room was full of support for new Police Chief Robert Shelide with officers from the Shelby Township Police Department, fire fighters from the Shelby Township Fire Department, officers from Shelide’s former department, the Southfield Police Department, and other local law enforcement agencies. 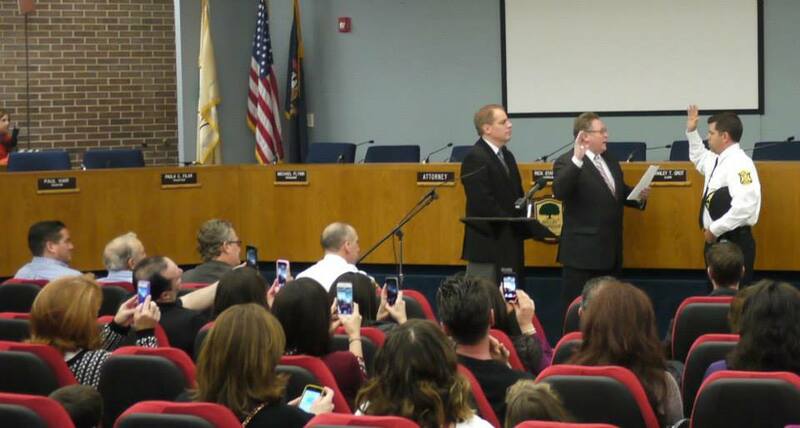 Shelby Township Clerk Stan Grot administers the oath of office to Shelby Township Police Chief Robert Shelide. Shelby Township Police Captain Steve Stanbury introduces Chief Robert Shelide prior to the chief’s official swearing in. Shelby Township Supervisor Rick Stathakis addresses the crowd prior to the ceremony to appoint Robert Shelide as the sixth chief of the Shelby Township Police Department.